These two volatile gods have been freed, regaining their tremendous power. One whips up storms that blow away whole islands; the other hurls white-hot bolts of thunder that scorch everything in their path. 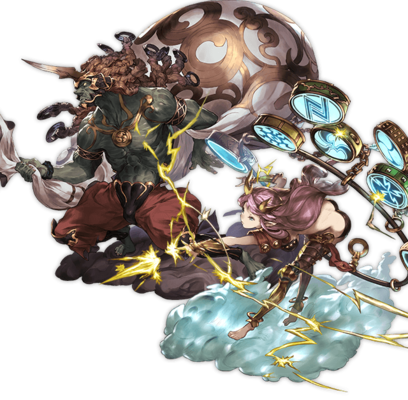 Nothing can stand against these gods when they work in tandem, even primal beasts. 25% boost to Wind and Light ATK. 40% boost to Wind and Light ATK. Massive Wind damage to all foes and bonus Light damage. 9T9 turn cooldown. This page was last modified on 1 March 2019, at 14:25.